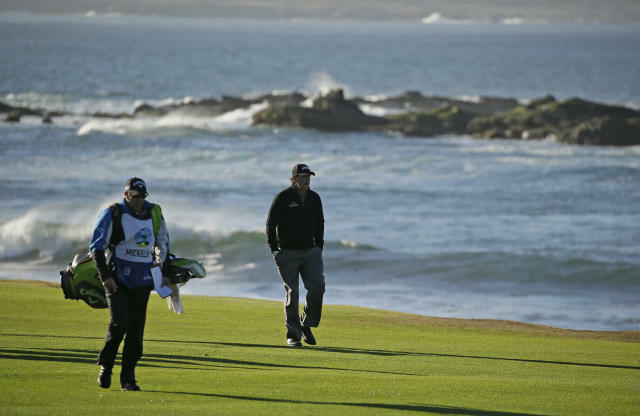 "We're trying to grow appropriately," Tom Knapp, executive vice president of programming and partnerships, said last week at Pebble Beach when Golf Channel announced plans to televise the Western Intercollegiate. "Somewhere in the 10-to-12 range feels right as a long-term goal." Golf Channel already has the East Lake Cup in the fall, along with the NCAA men's and women's championships in May, which has made for compelling television with eight finalists competing in team match play. "We learned a lot when we started doing this," Knapp said. "Thirty percent of sports fans are golf fans, and 60 percent of sports fans are college fans. To be able to combine those is huge for us." "We're trying to help with that to a degree that we can come up with a televised series that makes sense," he said. "Freddie and I go way back in the Presidents Cup," Woods said. "And we're basically coming full circle at Royal Melbourne. He and I teamed up in one our matches in '98, I was a captain's pick in '11 and now we get to return as two leaders of this team. We're going to have some fun, but we're there to win." In all, Casper won his 14 titles in California on 12 courses. That doesn't include the three-course rotation at the Hope. "No thank you. They can keep their money," David Girl Ortiz told the website. Kuchar used Ortiz for Mayakoba when his regular caddie couldn't make it. Kuchar earned $1,296,000 for the victory. Michael Bamberger at golf.com spoke to Ortiz through a translator. The caddie says the original agreement was $3,000, plus an unspecific percentage of whatever Kuchar won. Ortiz says he didn't expect to be paid like a regular PGA Tour caddie — a typical payout is 10 percent for a victory — but that he thought it was worth $50,000. The story was panned in social media last month when PGA Tour Champions player Tom Gillis tweeted about it, saying Kuchar paid only $3,000. Asked about it at the Sony Open, Kuchar said: "It wasn't 10 percent. It wasn't $3,000. It's not a story." According to the website, Ortiz wrote in a Jan. 24 email to Kuchar's agent, Mark Steinberg: "I am not looking to disparage Matt or give him a bad name. Fair is fair, and I feel like I was taken advantage of by placing my trust in Matt." Ortiz says he wrote three emails and received one reply from Steinberg that said in part, "What Matt has offered is fair." Alex Baldwin has been appointed president of the Web.com Tour, becoming the first woman to lead one of the six tours sanctioned by the PGA Tour. She replaces Dan Glod, president the last two years of the PGA Tour's main development tour, who is taking a role in sponsorship strategy. PGA Tour commissioner Jay Monahan called it a "watershed moment for our organization." James Hahn and Kevin Kisner have been elected co-chairmen of the Player Advisory Council for 2019. That means they join the PGA Tour Policy Board next year for three-year terms. Hahn and Kisner were elected over Paul Casey and Justin Thomas. An international player has never served on the PGA Tour board. ... Hall of Fame pitcher John Smoltz, who won the celebrity portion of the Diamond Resorts Tournament of Champions, is getting sponsor exemptions to three PGA Tour Champions events — the Cologuard Classic in Arizona (March 1-3), the Mitsubishi Electric Classic outside Atlanta (April 19-21) and the American Family Insurance Championship in Wisconsin (June 21-23). ... The Web.com Tour added the Robert Trent Jones Golf Trail Championship in Alabama to its schedule, to be played April 18-21. "The behavior is not acceptable. But what's going on? What's led to that behavior? That's the question." — Paul Casey, on Sergio Garcia damaging five greens out of frustration at the Saudi International.